This class is created for students who have taken a break from yoga or are new to yoga. 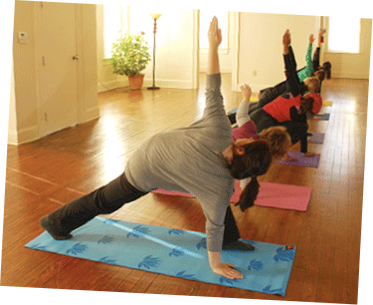 Students will be given more hands-on teaching to explain the basic yoga poses and develop the correct pose alignment. Students should expect a slow to moderate yoga class. This class is designed for those who are looking for a gentle workout, to loosen the body, and bring some quiet and peace to their day. It will leave students feeling refreshed, rejuvenated, and relaxed with the mind and body then ready to tackle the rest of the day. This class would be appropriate for those who have difficulties moving quickly from standing to the floor. Open to all levels. This class is open to all levels of experience; however, it would be useful if students have a basic understanding of yoga poses. Depending on the students, this class can vary from moderate, with basic poses, to strenuous with advanced poses and balances. Pregnancy is one of the most extraordinary times in a woman's life. Prenatal Yoga classes provide safe exercises designed to strengthen and relax your rapidly changing body, preparing you for a conscious childbirth and the opportunity for mother and child to bond prior to birth. Each class will have a theme, designed to be uplifting and to bring awareness. We will embrace pranayama/ breathing and meditation techniques, that relax the mind, giving focus during times of stress and uncertainty. This helps a mother discover a deeper sense of peace, empowerment, as well as, lifting fears and doubt out of pregnancy and birth. Come join the community of other women on a similar journey. All stages of pregnancy welcome. A private yoga practice can be arranged to accommodate your schedule. A private practice can be designed to be therapeutic in nature, addressing specific areas of pain or certain health concerns you might have working with the body as a whole to alleviate symptoms. A private practice can also be designed to deepen an existing practice, focusing on areas of weakness or bringing greater awareness and strength to an area of your practice you would like to deepen. This practice would be designed in a personal training manner, entirely focused around what you wanted to get from your practice. A private class can be arranged as a regular session, a one off, or with a specific goal in mind. This is a class especially set up for you, according to your schedule, for you and your family or friends. It could be as a celebration/special event, or designed with a specific focus in mind, for example: Yoga for runner or golfers, upper body strengthening, hip flexibility, balancing, lower back pain, etc. If you are interested in investigating this idea, please contact us to discuss.